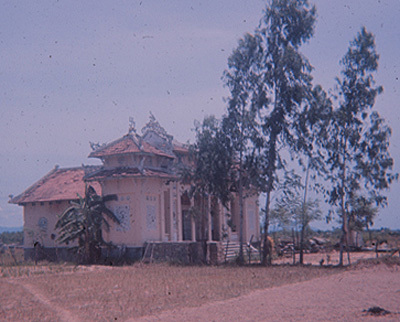 The Vietnamese in Quang Nam Province were mainly Buddhist, with a little animism thrown in. This Buddhist temple stood on the north side of the “Island,” a hamlet bordered by rice paddies on three sides and Highway 1 on the fourth. I remember hearing the temple bell early in the morning or around dusk, but never went inside farther than the from door.